Farewell Party at April and David Navazio’s House. Big “Thank You!” to our hosts for a beautiful evening. Bill Cleave, his son Miller and Mike Tusay Jr. went to Newark airport to pick up the Omiya students on Friday July 27. The flight landed on time, about 5PM. Severe thunderstorms prevented their luggage from being unloaded so they were delayed getting through immigration and customs. When they were finally collected and in the car there was a traffic mess due to all the rain. They Finally arrived at Mike and Madelyn Tusay’s home about 9PM. We all had pizza and the students settled in for the night. They had a hearty breakfast Saturday morning and met Nick Tusay, Mike Jr’s wife Laura and their children, before being taken to RJ’s home for their first activity. The Lewis’ got the kids on Saturday morning after getting back from a Billy Joel concert at 3am the night before (that was the only time we were more tired than the kids, then we rallied and wore them out). We took them down the shore to Long Beach Island (LBI) where they met my parents. We took them to Shop Rite food shopping on the way down. We ordered Pizza for lunch (sausage pizza was a big hit). They later said that was their favorite thing they ate all weekend. Saturday rained most of the day, but we were able to drive down to the lighthouse and the rain stopped just long enough to walk around, take pictures, and see the sights. It then started to downpour so we ran for the car. We could not climb the lighthouse because it was closed due to weather. Saturday night the weather broke so we had a nice bar-BQ of hamburgers and hot dogs. They really enjoyed A.J. and Morgan, and likewise. We will have two little broken hearts when they leave. Sunday the weather was great, so we had a beach day. Kainen (Kai-nen) and Norie (Nore – E-A) swam and rode boogie boards, while Saroi (Sour-E) played in the sand with A.J. and Morgan. They enjoyed the beach a lot. After a few hours of beach time, we went back, showered, had lunch, and took them on the way off the island to a friend’s Bar-BQ on the mainland where they could hang out with several other kids in the 14-16 year old age range. They had a great time (and we may have some future interest in my friend’s kids going on exchange to Japan). This was a mixed cultural group including Greeks, Cubans, etc.so it was a great cultural exchange in dialogue, and food options. The Cuban pork chops were their favorite. Monday they went off with Bill and Miller Cleave. Tuesday morning they went off with Kristy, Yolanda & Jake. They have been showing us pictures in the evening of their day’s events and we’re asking them what they liked best (Bill, they enjoyed Princeton University a lot, and buying Princeton stuff). They have been a little difficult to “rouse” in the AM. The girls in particular need a lot of time to get ready. I’ve been asking them to come down for breakfast at 8:15, as most pick-ups were scheduled for 9:00am; however, we’re knocking on the door at 8:15, and again at 8:30, 8:45, etc… They haven’t been “ready” until about 9:30/10:00 am both mornings. They are spending quite a bit of time in their rooms (I think on phones – Norie actually has two phones with her) in the evening and we have to coax them to come out and socialize a bit, have breakfast, etc… We gave them the remote last night and they got to watch a Japanese news channel (but in English) to catch up on home. My son, Miller, and I picked up the kids around 9:15AM at RJ’s. The students were tired and moving a little slower – so we got a bit of a later start. But, that was okay – because it meant we avoided the Philadelphia rush hour traffic. We drove to Philly and parked in Old City and took the Hop-On, Hop-Off double decker bus around the various sites. We also took a picture with the “Rocky” statue. We then got back on the bus and rode around the city and down to the Delaware River, etc…. They seemed to take lots of pictures and video. We rode the bus tour to the end and got off for a late lunch around 1PM. I decided to order “family style” and had the restaurant cut everything into pieces. That was a huge hit – we had calamari and a cheese plate to start. Then, we had cheesesteaks, lobster rolls, salads and French fries. All the food was a big hit and the students tried everything. Miller downloaded an APP that had an English to Japanese conversion – that really helped with the menu and conversation. If we were stuck and they didn’t understand the conversation, Miller would type in a phrase and it would convert to Japanese symbols. Then, he would show them the phone and they would understand and laugh. It worked really well for conversation. We found out that Kainen is studying Math/Engineering. And that Saori works in Tokyo each day…about a 30 minute train ride she said. Also, that Norie’s brother, Taka, was an Omiya exchange student 2 years ago. Then, we drove the campus of Lawrenceville Prep School and on to Pennington and had dinner at Sumo Sushi. My wife, Cindi, joined us for dinner. We found out, though, that Sumo is run by Chinese people – not Japanese. Same with many of the other local Japanese restaurants – including Masa in Lawrenceville and Muso Muso in Princeton. So, they didn’t have anyone at Sumo who spoke Japanese and they didn’t have any menus with Japanese. But, Miller’s APP helped with some of the translations and everything went off well. Very good food and, as with lunch, they ate well. We even had a Japanese Mango Cream Soda – which was really tasty. Finally, we took them back to RJ’s around 7:40PM. They were very tired but we took a group photo (at their request) and told them we’ll see them next week. They are great kids – very friendly and easy-going. A fun day. We went to King of Prussia mall today. Kids were super excited at the size of the mall, the incredible amount of stores and how big the mall map was! We arrived at 10:30am and literally shopped until about 5:30pm. We had lunch and kids discovered onion rings and loved them. Then continued to the other side of this mall monstrosity to conquer it. We found items for ourselves and presents for others! It was a great day. 3.6 miles (10,275 steps) of shopping per the iPhone! Kids then napped on way to an Italian dinner. Today Mike and Madelyn Tusay picked up our 3 OMIYA guests at RJ’s home at 9:30. After a long goodbye we drove into NYC to Disney’s ALADDIN on Broadway. We arrived and parked at about 11:30 and located a Popeye’s Chicken place on 40th street. We walked past the New York Times building and they took pictures of that. On the way Madelyn spotted a sign that said Times Square and they were very excited and took pictures of the sign as well. We had a light lunch of chicken tenders and biscuits. I did the ordering and we all shared the meal. This seemed to work out very well as they enjoyed the food. By the time we were done eating it was time to walk around the block to the New Amsterdam Theater on 42nd Street. It was built in 1902. This is an amazing palace of a theater. It is on the National Register of Historic Places and the interiors are unique to say the least. We arrived a little early so we could get our guests headsets which provided a Japanese translation of the story line as it was happening on the stage so they could follow the plot. They were very happy to have the headsets! The show was absolutely wonderful! The special effects were great. It even included a flying carpet! The students were able to get photos of the display cases which included memorabilia from the Ziegfeld Follies during intermission. They really liked the show and bought various souvenirs after it was over. We walked through Times Square and we showed them the lighted Ball which drops on New Year’s Eve. The City did not seem all that crowded. We stopped at the Marriott Marquis on 45th street and went up to the 8th floor lobby bar for a soda. The bar overlooks Times Square and the Ball. Madelyn ordered an Egg Cream from the waitress, who had never heard of the drink. She brought us our Pepsi’s and after a while came back to the table with a reasonable facsimile of an Egg Cream! We of course explained that this is a typical NYC soft drink and offered to share it. They each took a sip and the girls seemed to enjoy it, but Kainen did not. We all had a good laugh. We then tried to find an elevator to take us up to the revolving restaurant at the top of the hotel, both to get a view and to ride the glass elevator car up through the open atrium. We had a hard time doing this because the restaurant opened at 5 and we were early. Eventually we got on a car that was going back to the lobby and stayed on it and it went to the 42nd floor. They all enjoyed the view! We walked over the Sardi’s for our 5PM dinner reservation, through historic Schubert Ally and showed them many more theaters with an assortment of plays running. We ordered an appetizer sampler and they were able to taste a few things, like asparagus wrapped in salmon. There was even something that looked like garlic clove, but tasted like a sweet pickle. They said they had something like it in Japan. We took Bill’s suggestion for ordering dinner. We selected 3 different items, a pork chop, a curried chicken dish and a beef and pork cannelloni and told the waiter they would share the meal. He served the meal with extra plates and I helped them organizing the sharing. I even split one of my crab cakes and they each had a piece. They very much enjoyed tasting various items rather than selecting one item, as you could see they were not all that confident that their English skills might result in choosing an entree they might like. The meal was well received and we left Sardi’s to walk back to the parking lot. We happened upon 4 of New York’s Finest mounted policemen on the walk. They were lined up next to each other on 44th street. We of course stopped to take pictures with the horses on the streets of NYC. The rest of the walk back to get the car and the ride to Christine and Ken Secrist’s house was uneventful. All was quiet from the back seat as the kids dozed and listened to Mike Tusay Jr’s CD on the radio. We arrived there at about 8PM. They will be staying with Chris and Ken for the next 4 nights. All in all it was a great visit to the Big Apple! Our day in Philly didn’t go as planned but the students seemed to enjoy themselves. We connected with the students at the meeting and of course got a late start to Philly. ‘We’ being the students, Yuriko Bullock as guide and expert interpreter, her two daughters and myself as designated driver. Driving down 95 I did notice in the mirror at least one of the students asleep. On 6th Street in Philly I was in the wrong lane and traffic wouldn’t let me over, so we ended up on the Ben Franklin Bridge, so the students got a quick tour of beautiful Camden before Yuriko’s GPS got us on the way back. 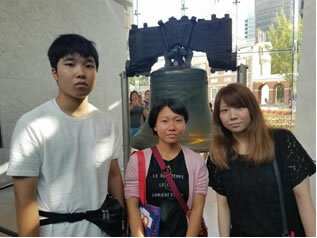 The students appeared interested in the history of the Liberty Bell and Independence Hall and we had the usual pictures at the Bell. A mandatory stop in the Visitor Center Gift Shop and I think all three purchased something. After the Bell we walked past Independence Hall to a cafe that Yuriko knew about a few blocks away and had a cold drink and chatted. No one expressed being hungry so we skipped the usual Cheesesteak stop and headed to the ballpark. The students all seemed interested in Baseball, and wanted to stay to the end, even after a 30 minute or so rain delay. I had planned on getting them Phillie shirts and hats but they beat me to it by hitting the souvenir shop and each came out with a bag. During the game they got hungry and they found a new taste of Philly, Chickie & Pete’s Crabfries which they had with the usual burgers and hot dogs, There was a ‘highlight’ when one fan proposed to his girl-friend on the Jumbotron, she said yes. Then it was back to the car, traffic getting to 95 and a couple of delays where Penndot was working on 95, and to Mike Tusay Sr.’s house a little after mid-night. We had a pretty full day with the students from Omiya. They started out touring River Horse Brewery at noon followed by a trip down to the Camden Aquarium. They were fascinated by the Sharks and Stingrays and were even able to touch sharks in the shallow pool. The Hippos were the highlight of the visit. We stayed for about 2 and 1/2 hours. Everyone was getting hungry and at about 5, Patti and I had something of a surprise for them. We took them over to Dave and Busters in Philadelphia and had an enjoyable dinner, went into the arcade and played a bunch of video and other fun games for the next two and a half hours. They accumulated more than 2,800 points and were able to trade them in for 5 pilsner glasses and a couple of other little knick-knacks, which made them all very happy. We headed home straight up Interstate 95, sat in traffic for about 30 minutes and arrived at the Tusay household at about 10pm. Nick greeted us at the door and treated us to a Japanese ice cream nightcap. We had a wonderful day! The plan was for my family to take the group white water rafting in the Poconos. Unfortunately, Mother Nature had other plans and the water levels where too high for my 7 and 8 year old to safely ride and the company cancelled the trip. But the weather was still beautiful and we headed to Jim Thorpe anyway. At Mike’s suggestion, we stopped at Hotdog Johnny’s for lunch on the way. Not surprisingly, we all enjoyed the junk food and the students, as well has my kids, tried birch beer for the first time. Everyone agreed it was an odd flavor but quite yummy. Once we arrived in Jim Thorpe we jumped on the scenic train ride. Where the rain ruined the rafting trip, the train ride was especially beautiful because of it. There were several impressive waterfalls along the way and many pictures were taken. After the train, we had our daily dose of ice cream (Kainen has very good taste, by the way. We both got chocolate peanut butter pretzel. So yummy!) and wandered around the town popping in and out of the fun, quirky shops. Later, we took the group to an abandoned train tunnel we knew of – and came prepared with flashlights. It’s basically a big cave that you can work your way through to the opposite side that overlooks the river. There was a lot of enthusiasm and we all enjoyed the climb, the view, and even the baby birds nesting in the rock walls. Then we worked our way down to the river bank and skipped stones. This was a surprising hit and full of general playfulness and laughs. We discussed what everyone would like for dinner and settled on Japanese food. I think the students were appreciative of something familiar and my family loves it too. I thought I knew of a restaurant in Newtown that was actually owned by a Japanese family, but sadly no. Ordering was not an issue though and they let us know the sushi and ramen was especially good. We all ended the night full and happy! Carol and I picked up the Japanese students at 10am at Mike Tusay- we caught the 10:30am train to NYC and then we SHOPPED, Shopped, shopped- they had fun (my favorite thing lol). We went to Marcy’s, Modells, multiple souvenir stores, M & M Store( big hit) and then ate lunch at the Stardust Diner – live entertainment – they ordered : 1- cheeseburger, the other 2 spaghetti and meatballs- they all love waffle fries. Then to Rockefeller Plaza, Lego store, – a little culture- St Patrick’s church and Trump Tower. Then more shopping including back to Marcy’s and Modell’s- we barely caught the 7:15 train to Hamilton. At 8:55pm we went for ice cream at Uncle Dave’s (it closes at 9pm)- 9:30pm we dropped them off at Scott Harrah’s house. They got their second wind and I went to bed- shopping is very tiring. My brother and I picked the kids up from Scott Harrah’s house around 9:30 and headed to the Delaware River. We put in at Neshaminy state park and made our way down to Philadelphia. Along the way we tried wakeboarding with moderate success. The kids even took turns driving the boat under close supervision. They loved that. We parked alongside the Moshulu and though it rained for almost half an hour when the sun came back out we quickly dried off. We went to Jim’s steak house and poked in some stores along the way on South Street. The kids all tried Cheesesteaks with wiz, provolone and American cheese. Blue Gatorade also seemed to be interesting to Saori though she thought it was still too sweet. We got some coffee at a local shop and Saori got some tea. Mine was delicious but hers was very hot. We then got rolled ice cream maki-aisu at a local shop. That along with the coffee triggered a dance party in this very hip ice cream parlor. The kids seemed very amused at this as well. I gave them 15 minutes to speak only English, but to no avail. Kainen was the only one who at least made an attempt to try English first. On our way back Kainen went tubing first and then Noriei. Noriei loved it! She rode the tube for almost 10 miles! We had dinner at King George’s in Bristol, had lovely conversation and rode back in the dark to Neshaminy. It was a full day, one I think they will remember for a very long time. 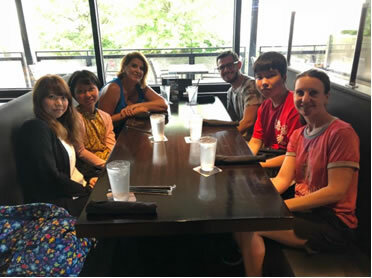 On Tuesday, 8/7/18, Scott Harrah brought the students to his office in Hamilton, where they were picked up by Chris Secrist and brought to her house. They met up with her daughter, Lori Czap, and granddaughters, Colleen and Amanda Heffernan, and Amanda’s boyfriend, Gabe. They were also joined by Yuriko Bullock’s daughter, Erica, and her boyfriend, Jason. By 9:45am they were all en-route to Six Flags Great Adventure, in Jackson, NJ. First ride was Nitro (maximum thrill roller coaster – enjoyed by all except Saori), then on to Skull Mountain (indoor/dark roller coaster – Saori and Colleen skipped this one). Next, ALL road the Skyway ‘Lakefront’ to the other end of the park to ‘Frontier Adventures’ to go to the Safari Off Road Adventure ride. For those who haven’t been to GA lately or ever, the Safari is no longer a separate ride where individuals ride through in their own cars, the Safari has been included as a park ride and the riders enter a large off-road truck holding up to 30 or so passengers and have a tour guide (Tara was very light-hearted and informative). Lori and Saori were taking lots of pictures. The heat and sunshine were taking a toll, and at times the only refuge was to pop into a souvenir shop (or the rest rooms lol). Then on to the Saw Mill Log Flume (ALL came back soaked), then lunch at the Best of the West next to the log flume. Lori and the students shared family-style chicken tender and fries platters, while the others used there GA passes and meal plans to make selections such as mac & cheese and pulled pork, etc. Next was the Runaway Train (roller coaster), then Houdini’s Great Escape (where the room swung back and forth, and spun upside down). Lots of stops at the refreshment stands to refill the water/soda cups (those with GA passes had refillable souvenir cups and GA does allow you to bring in water bottles and refill once inside). They wrapped up the afternoon with the Dark Knight Coaster. Other than the excessive heat, this was the perfect day to go to Great Adventure! Tuesdays in the summer are known to be less crowded, and there was not one ride where we needed to wait longer than one car load…some we just walked right on! About 25 Trenton Rotarians and their families attended the farewell BBQ at David home. David and April supplied the tent and the excellent food, from Mastoris Restaurant, as well as the use of their pool! Our Omiya students used the pool and mingled with the Rotarians and their children. President Hal Levenson helped organize a few group pictures (about 60 people!) and he bid our Omiya guests a fond farewell on behalf of the Rotary club of Trenton. We all individually wished them a safe journey home. My son, Miller, and I picked the Omiya students up at Scott Harrah’s house in Yardley at 6:30AM. They were ready to go – one even had their suitcase on the sidewalk in front of Scott’s house. We took pictures and they said goodbye to Scott and we loaded the car and got on the road. We made great time up to Newark Airport – no delays at all. On the way up, Kainen slept while Norie and Saori laughed and chatted the entire way up. They all had a lot more luggage than when they arrived – so I dropped them off at departures with Miller while I parked the car. We then checked them into their flights and then checked their luggage and took them up to the Security checkpoint. We took several pictures there and said many goodbyes. They were all smiles. They gave us a gift – including bags of tea made by Saori’s Father’s company. Also, Saori typed in her phone that they look forward to seeing Miller one day in Japan. Very nice! I think they were all happy to be headed home. And, it was a great day for flying – clear and not windy. I gave them each my business card and asked them to email me if they had any trouble getting through Security. We saw them go through Security and then we waited another 30 minutes or so. We saw their plane was in the gate and the monitor didn’t register any delays – so we left. They are all very nice – good people. Epilog: United flight 79 arrived at Narita Airport in Japan at 1:19 PM JST on Thursday August 9, 2018, after their 12hour and 56 minute trip.